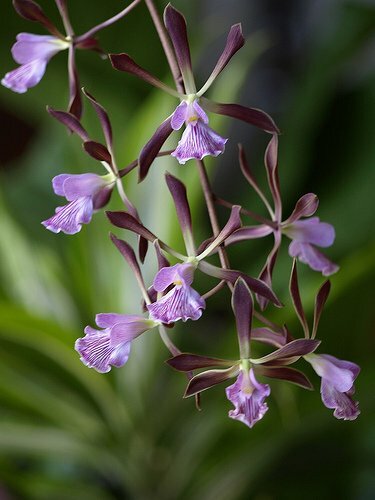 Encyclia orchids, relatives of the other Cattleya alliance orchids, require somewhat similar care. A number of "Encyclia" species were split off into related genera such as Prosthechea and Dinema in the late 1990s. The true Encyclias have a number of characteristics in common, including these: the flowers are resupinate, so that the lip is at the bottom (many Prosthecheas have "upside down" nonresupinate flowers); the lip has three lobes, with one on each side of the column and another conspicuous one beneath the column; flower stems emerge from the top of a round pseudobulb, and do not emerge from a sheath; and there are 2-3 leaves at the top of the pseudobulb. The plants usually have several flowers arranged along a lengthy inflorescence, and the flowers are fragrant, particularly Enc. alata. They come from relatively low elevations, and are distributed from Florida through Mexico and the Caribbean, and into parts of South America. They typically have thick, rounded pseudobulbs. The bract of the pseudobulbs is usually inconspicuous so that they'll appear a bright green. Most commonly, two to three leaves emerge from the top of the pseudobulb, which are somewhat thickened to retain moisture and have a single fold running down the middle. They are longer than they are wide, and have a pointed tip. Provide bright lighting, similar to Cattleyas or even more. In the northern hemisphere, use a south-facing window if you grow your orchids indoors on a windowsill. The reverse is true in the southern hemisphere. Direct sunlight is beneficial so long as the plants are adapted to it slowly, though there will likely be a bit of sunburn occasionally. Temperature requirements vary within the genus, but most like intermediate temperatures, in the lower 70's Fahrenheit (21-25C) during the day, with a 10-15°F drop at night (6-8C). They appreciate humidity of 50-80%. South American species like higher humidity than the more northern species. It's important to choose a potting mix that will dry out quickly after each watering, such as coarse fir bark, as they prefer to dry out very rapidly, within a few hours. They will also dry out more quickly if you avoid using too large a pot; keep them a bit pot-bound. These are plants that like to stay rather dry. The South American species don't need to be watered very often at all, and get most of their moisture from high humidity. Caribbean species like to be watered a bit more often, such as once a week. They expect a dry rest in winter, when they receive less water; increase watering somewhat when new growth starts, back off when the new growths are almost mature. For species from Florida and the Caribbean, try watering every 5 days during summer and every two weeks in winter. The Brazilian species should be watered very seldom, such as if you see the pseudobulbs shriveling, and maybe a few extra times during the growing season. Central American species are somewhere in between.